This section is about Shared Accounts as explained in Chapter 10, SavaPage Financial. The accounts are utilized in Delegated Print and PaperCut print scenarios. After a tap on the Accounts in the main menu this panel is shown. See Section 4.2, “Menu”. All accounts are listed alphabetically by default. 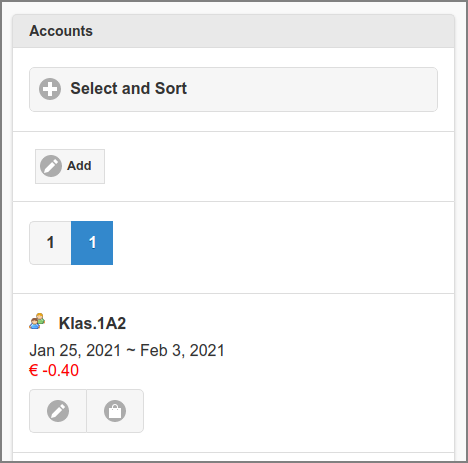 A different selection and sorting can be entered: see Figure 4.37, “Admin Web App: Account - List - Select and Sort”. The icon signifies a plain Shared Account and a Group Account. Press the New button to create and Edit a new Account. 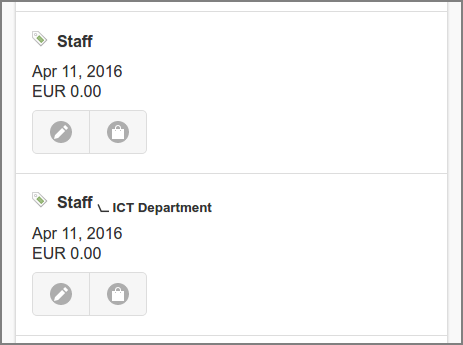 An entry is displayed for each Account, with the account type icon and name, the transaction period and the balance amount. Parent \__ child accounts are depicted with a subscripted smaller font child name. Tap the Edit button to change or delete the account. See Section 4.6.2, “Edit Account”. The Transactions button brings you to the list of transactions. This list has an identical setup as the one for User Account transactions: see Section 3.8.2, “Transactions”. Accounts can be selected by entering the containing text (fragment) of their Name. Select the Type and Deleted Status. The - button will select both. The list can be sorted Ascending or Descending on Name. Tap the Apply button to (re)display the list. A tap on the Default button resets the selection and sort to their default values. The minus button collapses the section. Group Accounts are ad-hoc created in the Delegated Print scenario, and have names identical to their User Group. 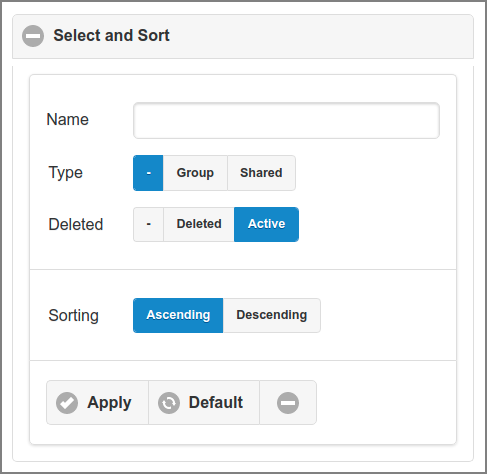 Editing of Groups Accounts is limited to Balance, Notes and the Delete option. Shared Accounts can be freely created, and can fully be edited as explained below. The Name must be case insensitive unique for parents and for children within a parent. For instance, the following Parent\Child name combinations can coexist: A\C, B\C, C\C. Shared and Group Accounts have different name spaces, so account name “A” can exist as Shared and Group Account. A "." (point) character can not be part of an account name. Group Accounts cannot act as Parent Account. Therefore the Parent Account must be a Shared Account. An Account that acts as Parent Account for other accounts can have no Parent Account itself. 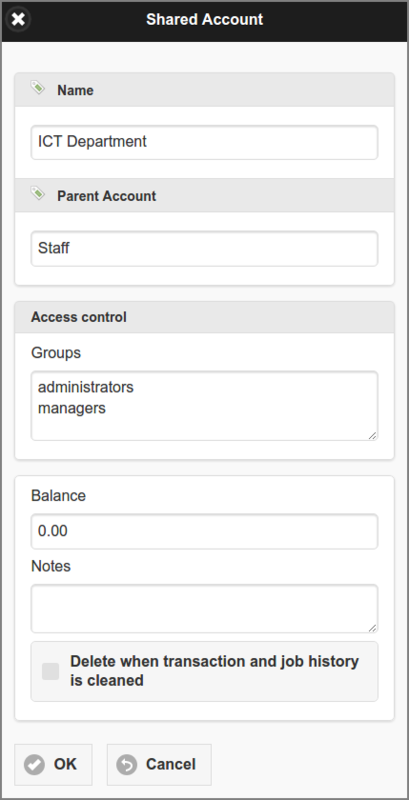 In the Access control section names of User Groups can be entered, whose members can use this account to charge (printing) costs on. See Section 3.5.5, “Print Job Settings” and Section 3.5.8, “Delegated Print Edit”. A new Balance value results in a financial transaction that corrects the previous account balance. See Section 3.8.2, “Transactions”. Tick the Delete checkbox to delete the Account. This will be a logical delete as long as transactions are present. Any logical deleted Account will be physically deleted from the database when no related transactions are present anymore. This situation will automatically occur when you enabled automatic backup in combination with the delete of old account transactions. See Section 4.10.13, “Backups”. A delete of a parent account cascades to all of its child accounts. An un-delete does not. Press the OK button to commit the changes and return to the Account List. The Cancel button brings you back to the Account List without changing anything.